Gerald is a renowned West Australian landscape and abstract painter working with oils, acrylic and pastels. The aim of the workshop is to paint an Acrylic Impressionist style landscape using a limited palette. Working from a photo reference supplied, we will make some slight adjustments to the composition. Using a fan tail brush to block in a tonal wash, then developing the painting with a Painting Knife, Primary Colours and White. 6. Tissues for keeping Knife clean during colour mixing. Gerald will provide a photo reference of a landscape but there will be some changes to it by adding a distant hill. It would be preferable if everyone did the same exercise, as it would be easier to keep track of everyone's progress. This weekend is a BYO Workshop. Bring along artwork you are busy working on with a dose of good cheer! Our very own Pam Gleisinger is conducting the February workshop! Pam will be demonstrating and instructing about studies in black and white. Selection of brushes (own choice). We will be looking at the different tonal values that can be obtained with a limited palette. 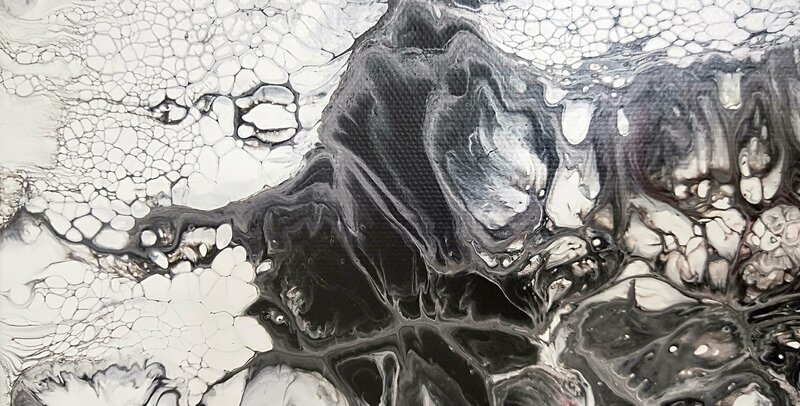 Pam will bring examples of different black and white paintings, but we will be painting an arrangement that will be set up in the middle of the room. We will have a female model for this workshop. You can paint or draw, using your preferred medium. The club has a supply of cartridge paper for quick sketches. Learn how to create extra life in your garden paintings by adding water drops! Keep your pictures simple. Just one water drop can look absolutely stunning when painted right! (See sample photos below).